Need a workout video that'll get you off the couch and ready to get fit?! No? 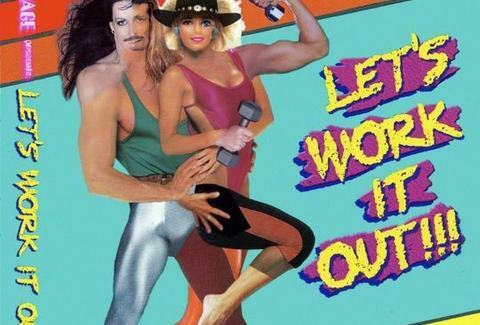 Then get ready for Let's Work It Out. From the obscure-clip mashup artist behind TV Carnage, LWIO's a two-years-in-the-making compilation of thousands of 1970s-90s fitness clips, artfully strung together in exploration of the pride, vanity, and pelvises of the inspirational lunatics who filled the airwaves late at night, and whenever CBS didn't have a one o'clock game. Maxing out the weirdness is a hypnotizing Chippendales pre-dance "warmup", a montage of people saying "buttocks", and zombie aerobics, whose participants suggest in lieu of getting off the couch the couch you at least feast on some graiiiiiiiins.